Carboxylic Acid Market size was worth more than USD 13 billion in 2015 and will increase with an estimated gain of 5%. Global carboxylic acid market size growth is expected to be driven by the rising demand of vinyl acetate monomer or VAM, on the account of increasing demand of vinyl ester resins used to coat the surfaces of materials used to store and package food items and beverages. Vinyl esters, in turn, are produced by reaction of acetic acid with the corresponding vinyl acetate monomer (resin). Increasing demand for packaged food owing to increasing global GDP along with shortage of time in dual income families will have a major impact on the market in the forecast timeframe. Moreover, ethylene-vinyl acetate (EVA) demand is also expected to rise because of its applications in the manufacturing of adhesives used in food packaging. Global VAM market size was over USD 7.4 billion in 2015 and is expected to have a growth by close to 4.5% CAGR from 2016 to 2024. Increasing demand for cosmetics and personal care products will also catalyze the global carboxylic acid market demand. Extensive usage of stearic, butyric, and valeric acids in the manufacturing of these products will influence the global carboxylic acid market in the forecast period. Rising awareness among the people about cosmetics and beauty products, in addition to increasing disposable income, will propel the market size considerably in the upcoming years. Usage of the acids for esterification to provide the fragrance and for prevention of microbes, tend to have a prevailing effect on the market. More than 80% of these personal care products are for cosmetics, skin care products, fragrances, and hair care products. Another important carboxylic acid market share booster is anticipated to be the growing use of organic acid in animal feed industry in order to prevent growth of microbes. Carboxylic acid such as formic acid and propionic acid prevent the growth of salmonella that contaminate the food and causes diseases to animals as well as humans. More than 45% of the global animal feed market is dedicated to poultry and more than a quarter is used for swine. The escalating consumption rate of poultry and swine for their health beneficiary protein content is likely to boost the global carboxylic acid market size as animal feed additive. Regulations regarding banning of antibiotic growth promoters in animal feed, especially for poultry, swine, and cattle, will also have a positive effect on the industry. However, the availability of organic and natural substitutes in the animal feed industry will hinder carboxylic acid market size in the upcoming years, as they have lost share to probiotics, amino acids, nutraceuticals, antimicrobials & antioxidants, and several other newly developed substitutes. Regulations on the production of petroleum based carboxylic acids with long chain hydrocarbons will also restrain the global carboxylic acid market growth in the forecast timeframe. Carboxylic acid market size has been segmented into acetic acid, propionic acid, formic acid, valeric acid, isovaleric acid, butyric acid, isobutyric acid, caproic acid, citric acid, stearic acid, and other carboxylic acids. Carboxylic acid market is expected to be dominated by acetic acid which finds great applications in the manufacture of vinegar, used to preserve food over a long time and gives a sour flavor to the food products. Growing demand of AA in food storage and packaging industry will steer the market growth in the next few years. (AA) Acetic acid market recorded over USD 5.5 billion in 2015 and is also expected to have the fastest growth at over 5.5% CAGR from 2016 to 2024. Another dominating product segment, throughout the forecast timespan, is anticipated to be stearic acid market which finds applications in cosmetics, soaps, detergents, as well as in lubricants and softening agents. It comprises of more than 25% of the global carboxylic acid market share and registered a revenue over USD 3.5 billion in 2015. 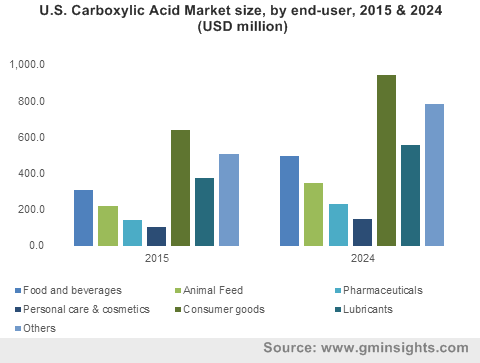 Different end-user industries of carboxylic acid market share include consumer goods, animal feed, food & beverages, personal care & cosmetics, pharmaceuticals, lubricants, and others. Consumer goods segment was the principal segment in 2015 registering over 35% of the global market share in terms of revenue. This industry segment is expected to develop at a CAGR over 5.0% throughout the forecast period. Growth will be primarily on the account of rising consumption of plastics in packaging, construction, electronics, and agriculture, boosting the demand of acetic acid and stearic acid. Asia Pacific, led by India, China, and Japan carboxylic acid market, is anticipated to have the fastest growth at over 5.0% CAGR in the forecast timeframe. It is also the most mature industry owing to the growth in food & beverage and consumer goods industries in the emerging economies of the region. APAC accounted for more than half of the global market share, registering a revenue over USD 6 billion in 2015. North America and Europe carboxylic acid market share will lose some value to APAC and Latin America due to stringent regulations imposed by EPA and REACH. North America registered a revenue over USD 2 billion, while Europe was worth more than USD 3 billion in 2015. These markets will have sluggish growth in the forecast period. Global carboxylic acid market share is highly fragmented with the top six market players possessing less than 25% of the global market share. Top industry players include BASF SE, Celanese Corporation, LyondellBasell Industries, Jiangsu Sopo Group, Eastman Chemical Company, and Dow Chemical Company. Among other important market participants, there are companies such as OXEA, Alfa Aesar, Perstorp Holding, etc. With continuous expansions, the competitive landscape is very aggressive. For instance, BASF SE invested in a new facility for formic acid production in 2014 to increase capacity.